U.S. foreign policy is a bipartisan fiasco. George W. Bush gave the American people Iraq, the gift that keeps on giving. Barack Obama is a slightly more reluctant warrior, but he is taking the country back into Iraq. Hillary Clinton, the unannounced Democratic front-runner for 2016, supported her husband’s misbegotten attempt at nation-building in Kosovo and led the drive for war in Libya, which is violently unraveling. Most of Clinton’s potential GOP opponents share Washington’s bomb, invade, and occupy consensus. The only exception is Kentucky Sen. Rand Paul. He stands alone advocating a foreign policy which reflects the bitter, bloody lessons of recent years. The Islamic State of Syria and the Levant is the latest result of Washington’s incessant and counterproductive meddling in the Middle East. Nowhere has U.S. policy been more disastrous. But the usual suspects are calling for more intervention, more war. This time, they promise, everything will go well. This is the Obama administration’s position in Iraq and Syria. However, Hillary Clinton has begun maneuvering for 2016 by running to Obama’s right. She consistently promoted a militarist policy in the Balkans and Middle East. She took a hawkish position on virtually every issue within the Obama administration. While she mocked the president’s mantra of “Don’t do stupid stuff,” she spent her career doing just that. Instead of offering an alternative leading Republicans are all in for war, more war, forever war. The dual donkeys of the apocalypse, Senators John McCain and Lindsey Graham, naturally have been advocating that America intervene more in both Syria and Iraq. 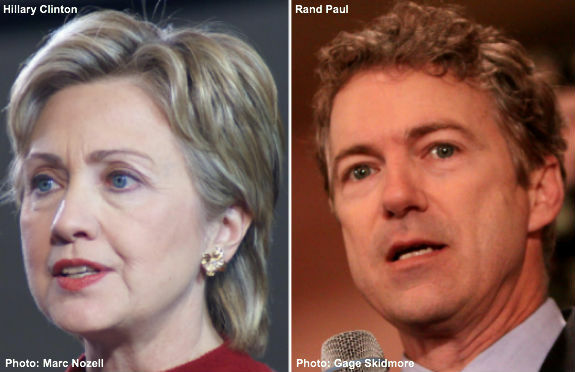 Most plausible Republican candidates are running toward the interventionist sideline. They blame Obama for Iraq even though it was George W. Bush who invaded that nation and failed to win Iraqi approval for a permanent U.S. garrison. New Jersey’s Gov. Chris Christie has ostentatiously joined the most hawkish GOP elements. Former Arkansas Gov. Mike Huckabee accused President Obama of guessing wrong in Egypt, Iran, Libya, and Syria, even though the president acted on the traditional Republican script in all four cases. Florida’s Marco Rubio advocated military action against ISIL. In recent years he’s given several speeches attacking the usual “isolationist” straw man (defined as not wanting to immediately bomb, invade, and occupy other nations at first provocation). Naturally, he supported the usual plethora of interventionist disasters: war in Libya, more involvement in Syria, and now combat in Iraq. Texas Sen. Ted Cruz also pushes a strongly hawkish agenda. Although he opposed bombing Syrian government forces he endorsed airstrikes against ISIL while blaming the president for its rise, suggested that a future president could repudiate any agreement reached with Tehran, and refused to offer an opinion on the wisdom of the original Iraq invasion. Last month Texas Gov. Rick Perry attacked Paul as an isolationist and advocating that the U.S. go back to war in Iraq. The former decried “military adventurism,” but when he ran for president in 2012 he surrounded himself with architects of Bush’s disastrous foreign policy. Michael Goldfarb approvingly said of Perry “you have to assume he’d shoot first and ask questions later.” Dramatically misguided was the latter’s contention that “isolationism”—in contrast to the promiscuous interventionism of the last three decades which has spawned so many vicious attacks—threatened to increase terrorism. Underlying the torrent of Republican criticism of Paul is fear. The American people are tired of incessant war-mongering by the Washington elite. Paul rightly noted that “The country is moving in my direction.” That’s scary if your political future is tied to policies that have failed so flagrantly and frequently. In citing President Ronald Reagan’s maxim of “peace through strength,” Paul noted some Republicans “have forgotten the first part of the sentence: That peace should be our goal even as we build our strength.” People are tired of young Americans being treated as gambit pawns in an endless series of global chess games, to be sacrificed whenever folks in Washington dream up a grand new crusade. Hillary Clinton represents today’s foreign policy consensus—of constant intervention and war. The best way for Republicans to lose in 2016 would be to nominate someone who advocates the same failed policy. But among potential presidential nominees only Rand Paul so far is charting a different course. Will others join him?